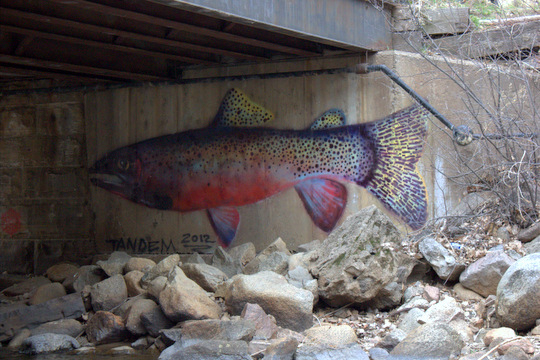 Having lived in Colorado for just over a year, I'm still learning the rhythms of my favorite trout streams. One of my favorite aspects of learning new water is scouting. These may just be the perfect fishing trips since there are no high expectations that can result in disappointment, at least not usually. Often, I find the stream more generous when I don't expect too much. 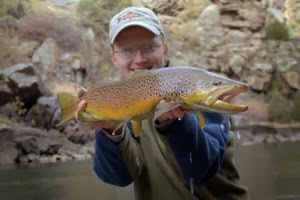 One favorite river system has a fairly well-known fall run of brown trout. 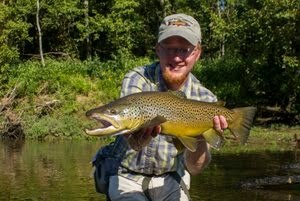 Last year I pulled a nice 20 inch brown out along with some other beautifully colored browns. 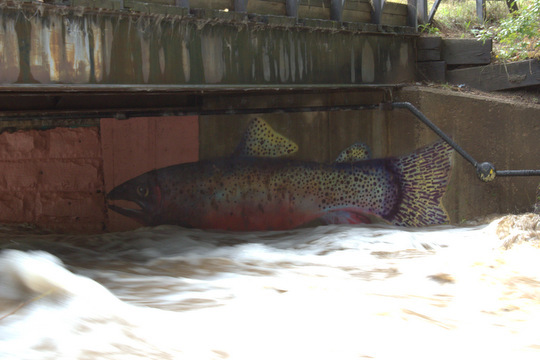 The best time is while they are running to their spawning grounds. Their aggression is general and directed at just about anything they see. 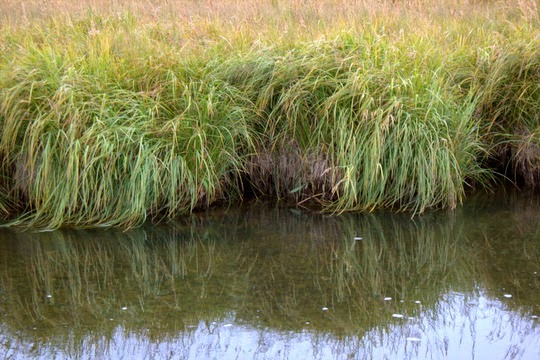 Once the spawn starts, these fish are focused and should be left to reproduce. 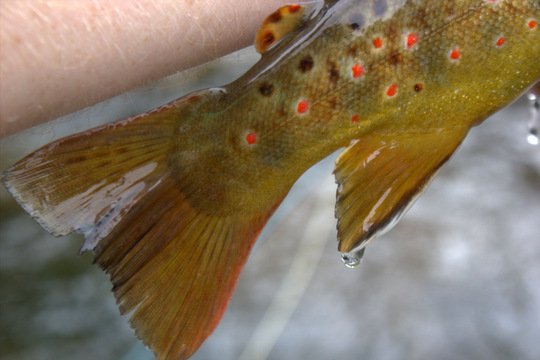 Most fish that are "caught" during actual spawning activity are snagged and this is not sporting. Fall is my favorite season and what better way to bring it in than a scouting trip? Last year, I knew the big fish showed up in early October. I also knew that on my last trip a few weeks ago, there were only a handful of larger resident fish in the system and no runner fish. Would the fish be there? The weather was threatening Sunday morning, but that is how I like it for fall fishing. Packing a fleece and raincoat along with the regular fishing gear guaranteed I would still be comfortable. The drive was long but scenic which makes any length of trip a bit more enjoyable. The highlight of the day was finding fall colors at higher elevations. 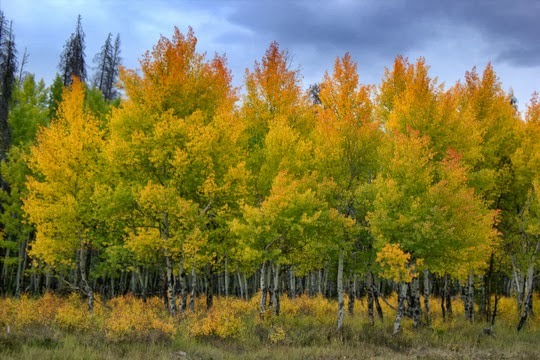 The aspen were incredible and not just the standard yellow gold either. No, many trees had rich orange and even red colors as well which is something I'm not really used to finding here in Colorado. One clump of trees was close enough to a pullout for me to stop and shoot a couple of pictures. The threatening sky muted the light, creating perfect conditions for photography. Driving further, I was soon along the stream I hoped to fish. The very first access point was wide open with no one in sight. Taking my time, I pulled on waders and topped everything with my raincoat. The rain was coming. 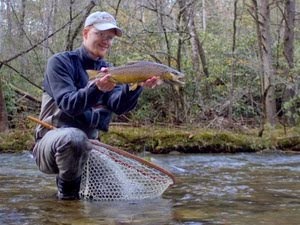 Large nymphs and streamers would be my weapon of choice for what I hoped would be large migratory brown trout. Working my way downstream, I quickly found my first fish in a deep but small run with an undercut bank nearby. It was a pretty brown with lighter colors indicating it had moved up from the lake. Then things slowed to a crawl. Naturally, the stream teased me until I was nearly ready to quit before giving up another gem. As is normally the case, the lake-run fish were spread out and hard to pinpoint. Things started to improve though as I stumbled upon some deeper runs and pools. There were even a few redds showing up in the backs of the best holes. By the time I got another nice fish, the rain was pouring. Thankfully I had stowed my old point and shoot Pentax and again I blessed its waterproof capabilities. Eventually the rain passed on, leaving clouds behind to remind me that the rain could come again. The stream proved to be quite inspirational. Sweeping grassy banks had me contemplating how good the hopper fishing could be if the nice browns were here throughout the summer months. I know that there are at least a few nice resident fish although the brookies definitely seem to have an edge in terms of numbers. Finally, in a series of impressive bend pools, I found some nice fish. Not every fish I found would eat, but enough nice fish were coming to hand to keep my forgetting my growing hunger. Finally, with thunder rumbling in the distance, I noticed the rumbling in my belly and decided it was time to eat. I headed back to the car and drove to a nice spot where I planned to fish after eating. I heated up some delicious chili and then added some Fritos. Chili and chips have become one of my favorite stream-side meals when I feel like something hot and filling. This day was no different. The thunderstorm skirted off to the south but a few stray drops kept things damp while I ate. While I was cooking, a gentleman from Kansas came by and asked if I had found a fly box. Unfortunately I had not fished yet so had not found a lost box. He looked for a while and was unable to locate his box. I took his name and email in case I could find it but luck was not with me on this day when it came to finding lost stuff. I was lucky as a fisherman however. 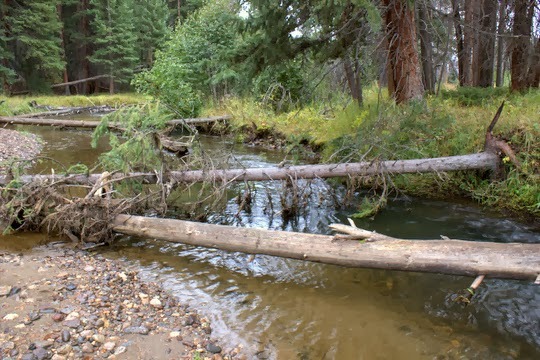 Working up the stream, I found one particular deep spot where trees had fallen across the stream. 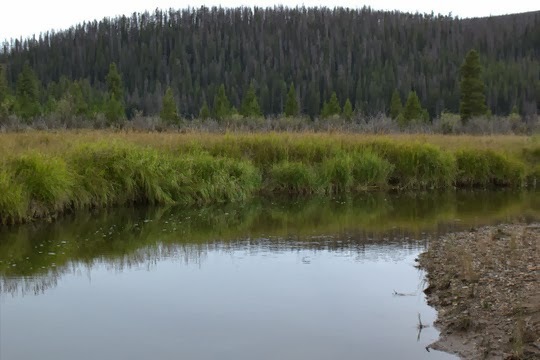 Having spotted nice trout here in the past, I always toss a fly in when I am in the area. On today, I carefully maneuvered into position and tossed my fly in between the two logs. 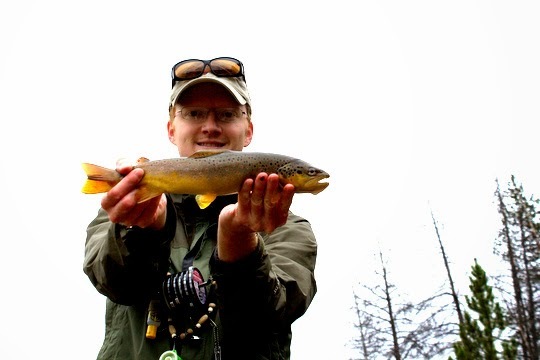 When a brown shot out to slam the fly, I was glad that I had 2x tippet on. The fish tried to run upstream and down, but the stout 5 weight rod kept the pressure on, and soon I was slipping the big net under the fish. Based on where this fish lived and its coloration, I believe that it was a resident fish instead of a lake-run fish. I'm also pretty sure I spotted it last spring on one of my early trips to this stream. At this point, thunder was threatening again. The sky was ominously dark and the wind was picking up. I decided to call it a day. Not long after starting the drive home, the storm broke in its full fury, pounding the landscape with sleet. The temperature dropped into the low forties. Further south, I escaped the storm and noted white up high on the mountains above. The first high country snow of the year had fallen and would continue into the night. Fall is definitely here!!! 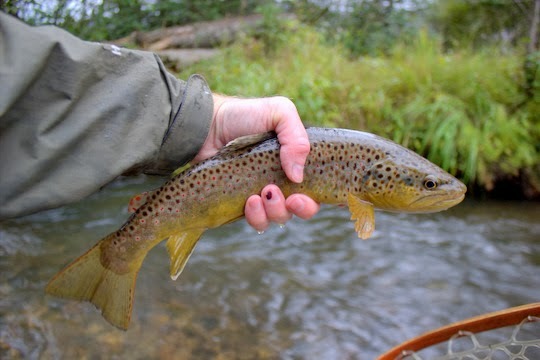 Have you ever found a piece of water that just begs for a particular fly or presentation? Of course you have. 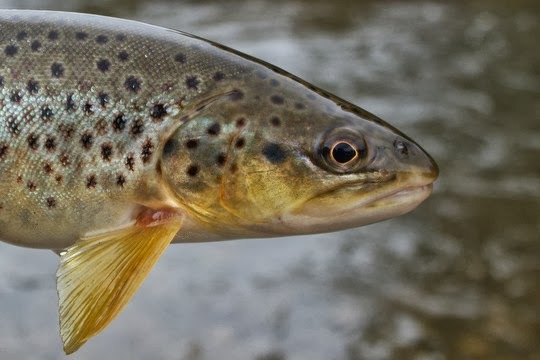 We all have a particular log jam that we always toss a streamer at or a dry fly slick where a trout is normally poking its nose out of the water to the prevailing hatch. We probably even have a favorite run that we prefer to nymph. Back in Tennessee, I had a section of bank on a tailwater that had a bunch of overhanging trees. Terrestrials were the ticket in the summer on that section. All of us enjoy catching a large fish every now and again. 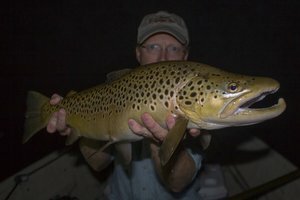 My preferred catch is the brown trout but of course I will not turn down catching other species and it is even better when they are large. 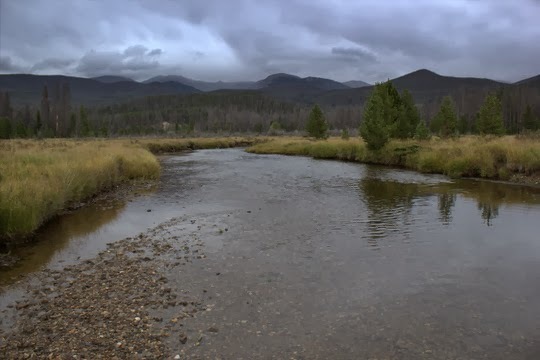 A month or so ago, I stopped to sample a small meadow stream I had never fished but that showed great potential. 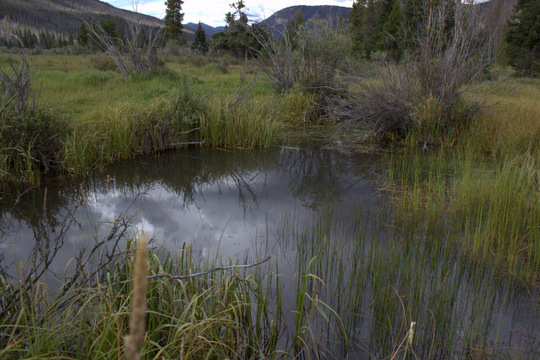 I'll admit, I have a soft spot for meadow streams. Perhaps this is because we don't really have such a thing back in Tennessee (at least not trout streams) and the novelty is what appeals. 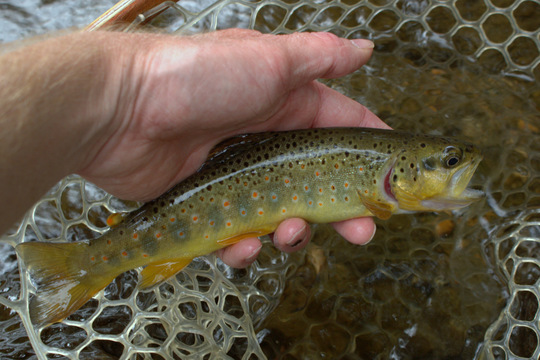 Then again, maybe it has something to do with the fact that I normally catch some really nice trout on meadow streams. Regardless, I was doing some quick scouting to see if I would want to return. Mostly I was just covering water. 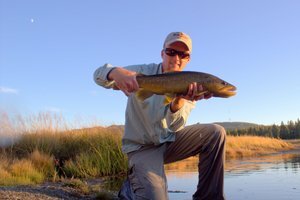 If good fish are present, you can usually at least spook one or draw one out from an undercut with the right techniques. It wasn't until I threw in a bend pool well downstream of where I accessed the water that I saw the large shadow swirl on my fly. Quickly, but without much hope, I threw it right back for another try. Amazingly I had the same result but the fish again missed the hook point. On the third try, I started ripping the small streamer back in my direction and this time there was no doubt. A big rainbow had hammered the fly and proceeded to run around the small stream in every direction it could think of. Having lived here in Colorado for more than a year now, I'm still exploring new water. Some places are obviously way out of the way such as high alpine lakes. Others are quite accessible, I just haven't tried them out yet. 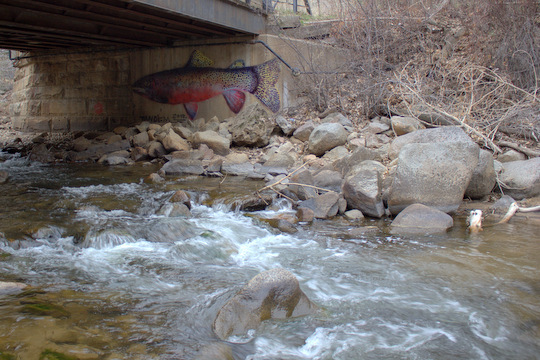 South Boulder Creek was one such destination. 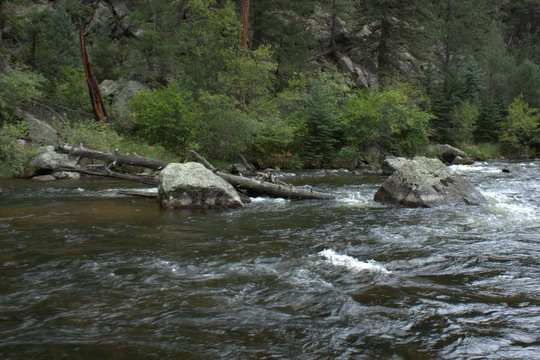 Close to Boulder, the tailwater section receives a lot of pressure. Finding open water can be challenging. The hatches are worth it though. I arrived right in the middle of the day. Sleeping in is always attractive on my days off so I had a leisurely morning. By the time I arrived, I considered myself fortunate to grab the last open parking space. Armed with my favorite 5 weight and ready to do combat with the anticipated crowds, I started walking downstream. Whenever I fish tailwaters, be it here in the west or back east, I always notice people standing right in the middle of the better runs. This day was no different. Some of the best holes had people right on top of where they should be fishing. So much for stealth. Meandering down the river, I found some nice spots, but each time I was nearly ready to jump in, I would notice another angler already working the water. A rough canyon stretch that was better left to the wild critters was finally free of any other fisher folk. Carefully working my way down a boulder field, I pushed through the tangle of willows lining the stream only to discover that I wouldn't be wading far. The water was deep and swift. Very carefully I worked the edges. Then I waded as far out as I dared and worked the far current seam. 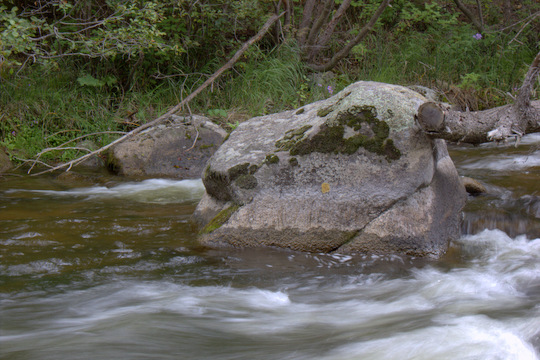 Sure enough, tight to the boulder providing a break in the current, my first fish rose energetically. After a few more casts, I noticed the water just upstream had been vacated. Hating to fish used water but preferring it over swimming, I somehow slithered and stumbled my way upstream over rocks, through willows....and found a paradise. The section I was now gazing over was a bit wider meaning I could wade all the way across if I was careful. By this time, drakes, PMDs, rusty spinners, caddis, and a few stoneflies were all making an appearance. I love fishing big dries and dug out a big Parachute Adams that was close in size to the drakes I was seeing. Fish started to hammer the big dry as soon as I tossed it out. Working the closer water first, I slowly started fanning out with my casting to cover the water meticulously. On just the other side of the main current, I noticed a couple of rises. Casting over, a better fish took the fly and promptly headed for fast water. For a couple of minutes it was touch and go. 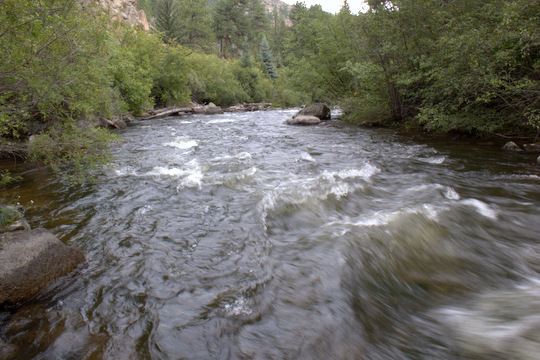 Then the fish went over the rapids below, and I just knew I had lost it. Incredibly, the 5x tippet held, and slowly I regained control. It wasn't until I slipped the net under the fish that I looked up and noticed several spectators giving me the thumps up. Glad I landed that fish! By now the hatch was getting heavier and fish were rising everywhere. Proceeding slowly upstream, I caught fish after fish, missing as many or more than I was landing. Most were small to medium sized rainbows and browns although every once in a while a better fish would eat. Taking time to look at the scenery, I noticed signs of fall on the far bank and took time to take pictures. 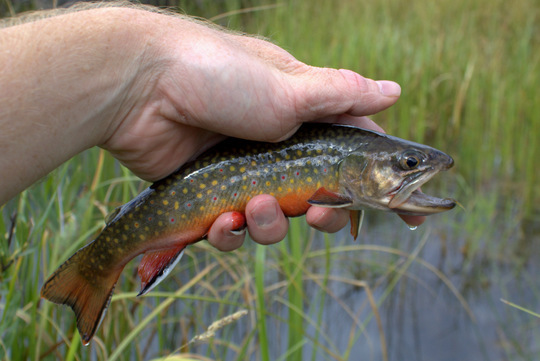 The heat is still holding on here on the plains, but it will be no time at all before the nights are cool and crisp and the browns and brookies are spawning. The elk are already bugling up in Rocky Mountain National Park. The best time of year has arrived!! !